very different side of Florida. than just pick oranges and strawberries. The City of Lake Wales was established along the state's geographical ridge, a ridge that boasts the highest elevation in the peninsula, 295 feet. So, figuratively speaking, it sits at the top of Florida. Lake Wales is located east of Tampa and south of Orlando near the intersection of State Roads 60 and 27 and has a population of 10,027. The cohina Bok Carrrillon Tower. The Lake Wales Land Company established Lake Wales in 1911, though folks have lived in the area for over 3,000 years. Artifacts of the Native Americans can be found along the many lakes where they once hunted and fished. In the early 1800's the white settlers arrived, who peacefully traded with the Seminoles. Interestingly, the town's name is slightly different than its namesake lake. Lake Wales lies next to the body of water called Lake Wailes. Local lore has it that one of the town founders dropped the "I" from the name because it looked sad. 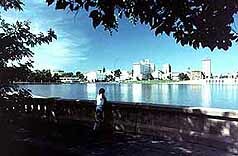 The Lake Wales area features some interesting area attractions like Bok Tower Gardens (tel. 239/676-2392), a philanthropic gift from the founder of Vanity Fair magazine, Mr. Edward Bok, a Dutch immigrant. 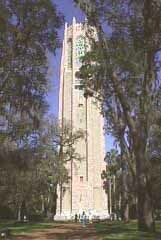 The tall coquina tower is a national historic landmark which looms above orange groves and forests of oak and pine. Mr. Bok created the bell tower and the ample 157-acre park in 1929 as a sanctuary for wildlife and people. The Carillon Tower, famous for its haunting bronze bell recitals are played hourly. The gardens and 30-minute hiking trails are spectacular in both the warm and cool seasons. No visit to Bok Tower would be complete without a drive to nearby Spook Hill, a small hill next to a local elementary school which is rumored to possess a supernatural force that makes objects move uphill even at a downslope. The Indian legend of the hill tells of a great warrior who killed a giant alligator there, and a small lake was formed during the conflagration. The chief was buried on the north side of this small depression, and the mysterious force is either the chief is protecting his land or the alligator seeking revenge. Try it and decide for yourself. Located between Bok Tower and the now-closed Cypress Gardens, old fashioned charm in a countrified setting meets modern sensibilities at Chalet Suzanne's 5 star restaurant and inn, which actually has a landing strip for private planes. See our aviation section for more about the importance of aviation in this area. The City of Lakeland, surrounded by gentle rolling hills and 13 freshwater lakes, was established in 1883 as a railroad outpost. Its current population is around 169,000. Located 35 miles southeast of Tampa, and an hour directly south of Orlando, the city has a slogan that epitomizes its central location in the State of Florida, "Close to everything, next to perfect." 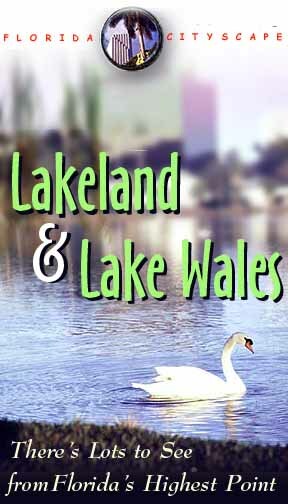 The city's Chamber of Commerce is so confident that tourists will agree that Lakeland is so perfectly situated, they offer a Passport to Lakeland which allows visitors to spend eight days lodging in the city, visiting every Central Florida attraction or amusement park without changing motels. Disney World, all the Orlando theme parks, and other attractions like Busch Gardens are all less than an hour away. A savvy Kentucky businessman named Abraham Munn forsaw the importance of the railroad to the region between Tampa and Kissimmee, and established a train depot in 1883 to attract new industry. Soon business and agriculture flourished in the area, especially when a nursery owner named Ed Tison developed the seedless grapefruit. A lucrative strawberry industry soon followed, and by 1885, Lakeland's first hotel, The Tremont, was built. A building boom in the 1920's led to more growth, and in the 1930's architect Frank Lloyd Wright designed a collection of buildings for Florida Southern College. For many years the major point of interest near Lakeland was Cypress Gardens, Florida's first tourist attraction, which has become a remnant of a bygone era. Located about 20 miles east of town off State Road 27, it is known for its fantastic gardens and spectacular water skiing shows on Lake Eloise. In 1936, Richard Pope and his family created the beautifully manicured gardens next to the lake's moss-draped cypress trees. But during the 1940's, a big freeze caused the loss of many plants, and tourism began to drop off. To lure guests back, pretty employees dressed as Southern Belles and stood at the gate. The same gentle sandy hills surrounding the lakes also designate Lakeland as a citrus center. In the spring, open your windows to take in he heady aroma of orange blossoms as you drive by. Phosphate mining is also a major industry in the area, as it is plentiful in the fossilized soil from the glacier period. In fact, 70% of all phosphate mined in the US is from Central Florida. Many of these mines are visible east of Lakeland on State Road 60. Downtown Lakeland's Munn Park boasts both an antiques district and a historic district, with over 50 shops, galleries and restaurants. The versatile Lakeland Center, a popular entertainment complex for sporting events, concerts and conventions, provides 90,000 square feet of exhibit space and a banquet hall for 2,500 people. Spring is a busy time in Lakeland, and there's something special for everyone. Folks who love action should know that Lakeland is the site of the Spring Training camp for the Detroit Tigers as well as the nation's second largest experimental aircraft convention, the Sun 'n Fun Fly-in, which attracts aviation enthusiasts from around the world every April at the Lakeland Linder Regional Airport. An adjacent museum displays memorabilia, home-built aircraft and some of Howard Hughes' collection. The nearby Fantasy of Flight Museum (239/984-3500) features hands-on flight simulators and vintage aircraft. Lakeland is also home to the USA International Speedway racing facility (1-800-984-RACE), the southeast's largest short track. For the cultured crowd. the Mayfair-by-the-Lake art festival sponsored by the Polk Museum of Art draws thousands to its juried show every Mother's Day weekend, and the popular and famous Black Hills Outdoor Passion Play is held every Easter at the Carpenter's Home Church (888/622-8383).